If you ever desire to generate any profits from the Forex market, then you need to be able to identify and use trends to guide your trading decisions. This article will provide a guide on how to identify forex market trends and how to profit from them. The first thing that you need to do is open your Forex charting platform at XFR Financial Limited and create a price chart for the currency pairs of your choice. The next thing you should do is identify the valleys and peaks on the price chart. These are the points at which the price of the currency pair reversed its direction. The next thing that you should do is take a look at the most recent price action on the chart and identify the most recent high that the price of the currency pair made. Next, you also need to identify the previous high that formed before the most recent high and so on. Besides the highs, you also need to identify the lows on the charts XFR Financial Limited provides. You also need to find the most recent low, followed by the previous low before the most recent low and so on. If you can determine clearly that a given currency pair is making ‘lower highs’ and ‘lower lows’ then it is following a downward trajectory meaning that it is trending lower. This means that you should be looking to sell that particular currency pair. 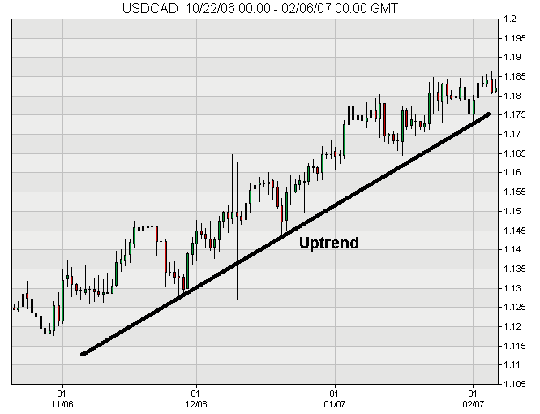 If you can determine that a given currency pair is making ‘higher highs’ and ‘higher lows’ then it is following an upward trajectory meaning that it is trending upwards. This means that you should be looking to buy that particular currency pair. In case you are still confused and cannot clearly tell whether the market is on an upward or downward trajectory then draw a straight line on the price chart connecting all the recent lows and another one connecting all the recent highs. This will help you determine whether the price of the currency pair is decreasing or increasing. You can also use the moving average crossover to help determine the trend of a particular currency pair. The crossover happens when a moving average of a shorter period crosses above or below a moving average of a longer period. An example by XFR Financial Limited - if a 10-day moving average of a particular currency pair crosses above a 20-day moving average of the same currency pair then you can determine that the pair is following an upward trend. This article has looked at some of the most basic and effective ways of identifying trends in the Forex Market. However, you need to understand that even though trends are effective tools for guiding you into making the right trading decision, they are not a guarantee that you will always make a profit with XFR Financial Limited. For instance, it is not a guarantee that you will generate a profit each time you sell a currency pair that is currently on a downward trend. However, coupled with other trading tools and systems, trend identification can help you make profits in the Forex market.